The source of River Yamuna, Yamunotri is also one of the four sites of Char Dham pilgrimage. Yamunotri is located at a height of 3293 mts above sea level and located in Uttarkashi district. It is surrounded by mountains on all sides and lies in close proximity of the Indo-China border. The Bandarpunch Mountain is at a height of 6315 mts and lies north of Yamunotri. Yamunotri is at a distance of 236 km from Rishikesh, 21 km from Sanya Chatti 278 km from Dehradun, and 176 km from Chamba. Yamunotri temple Gates Closing Date 2019: The Yamunotri temple has been closed on 9th of Nov for 2018 to 2019 winter session. Currently the deity of Yamunotri is seated at Kharsali Village of Uttarkashi. Yamunotri temple closing date for 2019 winters will be updated soon on our website. Note: To book your Char Dham Yatra for 2019 session, please visit sacredyatra. Religious tourism : Yamunotri holds an important place in Hinduism. 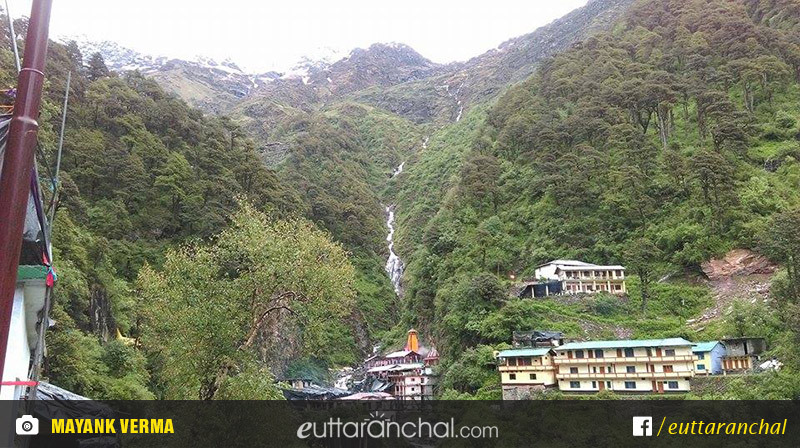 Explore the holy Yamunotri temple, pray at Divya Shila, and dip into Surya Kund. Trekking : The trek to Yamunotri from Jankichatti is a short challenging one. Feel the essence of being surround by the mighty Himalayas and the wonders of nature as you ascend towards Yamunotri. Photography : The scenic beauty of Yamunotri is an ideal environment for photography enthusiasts. The wild flora and flora and the white snow are something no photographer should miss capturing in Yamunotri. Village tourism : The villages around Yamunotri serves as excellent places for exploring. Know about the local cuisines and local culture as you hike through the villages. Camping : Experience nature on the go with camps set at picturesque locations. Camping around Yamunotri region is a good option for people who love nature and adventure. Village Tourism: Visit local villages & learn their culture like food, religious belifs & house architecture. There are plenty of accommodation facilities available at the route to Yamunotri. 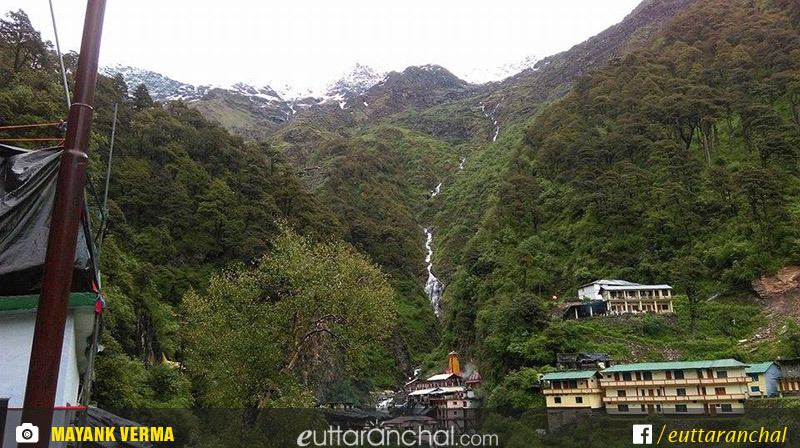 You can stay at Hanuman Chatti or Janki Chatti from where the trek towards Yamunotri begins. There are accommodation options available nearby Hanuman Chatti and Janki Chatti too. Availability of food isn’t a problem at Yamunotri as there are numerous restaurants in the route to Yamunotri. The restaurants serve breakfast, lunch, and dinner. You’ll come across small shops serving tea and lunch even while trekking. The Yamunotri Temple is dedicated to Goddess Yamuna, an iconification of the second most sacred river of India, River Yamuna. Goddess Yamuna is the twin sister of Yama, the God of Death and is believed to be the daughter of Surya Dev, the Sun god and Sanghya, the Goddess of Perception. In the Vedas, Goddess Yamuna referred to as Yami, the Lady of life. The Yamuna was named so by an angry Surya Dev who felt insulted when Goddess Sanghya couldn’t see him in the eye due to his dazzling light. She flickered while trying her best to open her eyes in front of Surya Dev. Since Goddess Sanghya had tried to open her eyes, Surya Dev blessed the Yamuna that she would be revered as a goddess and remembered eternally. Goddess Yamuna also inherited the frivolous nature through this incident. According to legends, the great sage Asti Muni lived as a hermit in the Yamunotri region. He bathed at both Ganga and Yamuna rivers throughout his life but as he became old he couldn’t travel to Gangotri. A stream of Ganga emerged opposite to River Yamuna just for his uninterrupted ritual. Yamunotri presents a rare sight of Ganga and Yamuna together. Kalind Parvat, the mountain peak that lies adjacent to the source of Yamuna River is named after Surya Dev. Surya Dev is also known as Kalind and gushing out of Kalind Parvat, Yamuna is also referred to as Kalindi. Legend has it that Lord Hanuman after burning Lanka extinguished the fire from his tail in the icy waters of Yamuna at Banderpooch. Hence the peak is called as Bander (monkey) Poocch (tail). Devotees believe that taking a dip in the holy waters of Yamuna washes out their fear of death and relieves them of their sins. 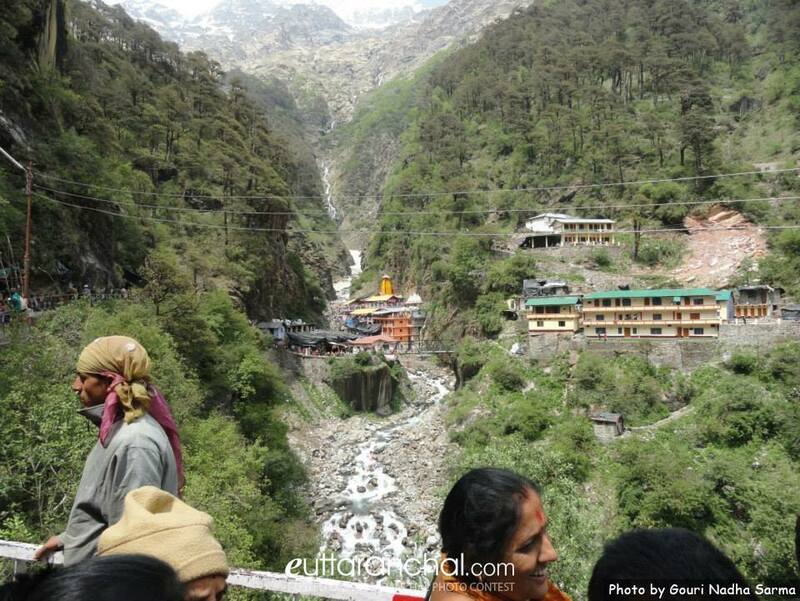 Pilgrims visit Yamunotri temple to seek the blessings of Goddess Yamuna, Yama, Surya Dev, and Goddess Sanghy. Some of the prime attractions of Yamunotri are the Yamunotri Temple built by Maharani Guleria of Jaipur in the late nineteenth century. There is a small hot water spring at Yamunotri, Rice and potatoes are cooked by pilgrims in this water and served as prasad. Devotees also pay respect to Divya Shila, a rock pillar just before entering the Yamunotri temple. Yamunotri dham is the first temple in the series of char dham circuit, Hindu pilgrims throughout the world come here for temple darshan and to take blessing of Yamuna mata at Yamunotri temple. To reach here, you can book your train to Dehradun which is the nearest rail head to Yamunotri and is the captial of Uttarakhand too. From Dehradun you can do further road distance on private vehicle, booked car, sharable jeeps or in other public transport. The route of Yamunotri also have a small trekking distance. The trek to Yamunotri Temple begins from Jankichatti. 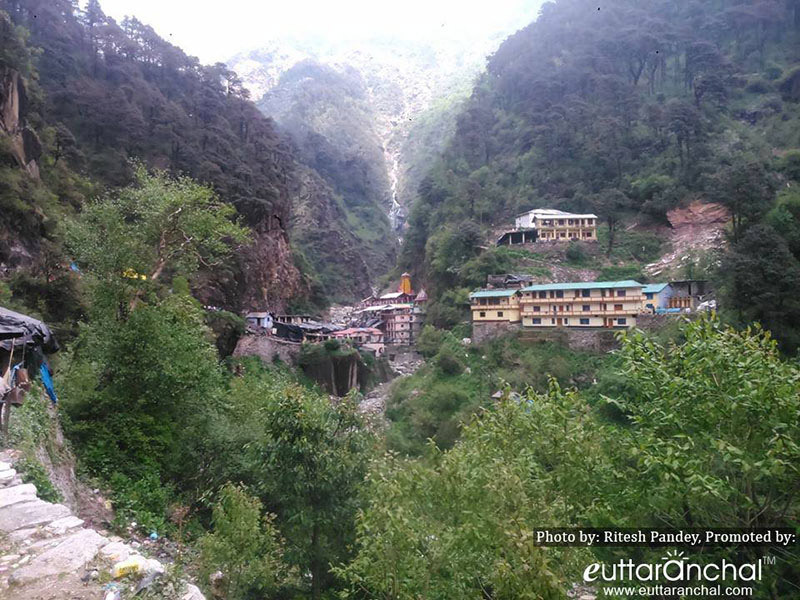 Yamunotri is 6kms from Jankichatti. Below is the detailed travel guide to Yamunotri Dham of Uttarakhand. Although you can travel to Yamunotri by private but here we will tell you the option of public transport for common man. At Mussoorie bus stand, near Dehradun railway station, you can get the buses to Barkot which is nearet town to Yamunotri and transport is easily available from Dehradun to this city. Barkot lies at a distance of about 136kms from Dehradun. You can hire jeeps for Jankichatti from Barkot. Jankichatti is around 45kms from Barkot and it takes around 1.5hrs to reach Janakchatti or use sharable jeeps to reach Jankichatti. You will have your dinner and rest at Jankichatti today and begin the trek for Yamunotri early in the morning. Accommodation facility is available at Jankichatti for pilgrims. You’ll have your breakfast and begin the trek towards Yamunotri temple early in the morning. The trek to Yamunotri temple from Jankichatti is a 6kms trek and is facilitated with amenities like water points, benches, and resting spots along the routes. You can have tea in the small tea stalls along the way. It will take around 2-3hrs to reach Yamunotri temple. You’ll trek your way through white snow, dense forests, wild flora and fauna, and fascinating streams and lakes. The snow-clad Himalayas surrounds you as you move forward. Though the distance isn’t difficult but it does contain some steeps and can be tiring. However, once you reach Yamunotri temple and take in the mesmerizing scene around you, you’ll feel extremely content and peaceful. 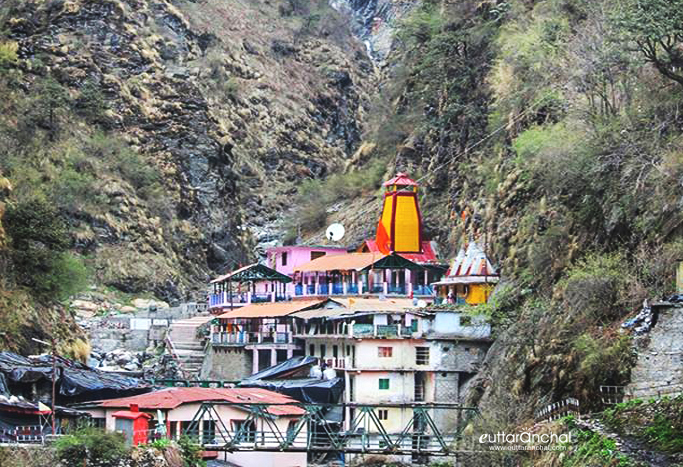 At Yamunotri temple, you can attend the puja ceremony, have your lunch, and explore the area. You’ll return back to Jankichatti in the same day and stay there for the night. You’ll return to Dehradun today. Before leaving for Dehradun, you can explore Jankichatti. However, ensure that you leave early for Dehradun as it will take around 7hrs to reach Dehradun. You can visit to Yamunotri from May to October but most of the people often avoid to visit Yamunotri in the month of monsoons because of frequent rainfall & landslides in the hilly regions. The best season to visit Yamunotri temple is from September to October because of less crowd and budget hotels. Although, May & June are also good time to visit but at this time this pilgrimage recives high number of pilgrims which can make you uncomfortable at the time of darshan and to find budget hotel. What is Yamunotri famous for? Yamunotri is famous among tourist as Temple and Treks. Yamunotri is recommended destination for Family and Kids, Foreigners, Groups, Solo. Yamunotri is popular destination for following activities/ interests - Char Dham, Pilgrimage, Temples, Trekking.